The hydraulic fluid is directed to the throttling point via lateral bores . It is formed between the housing and the adjustable sleeve . 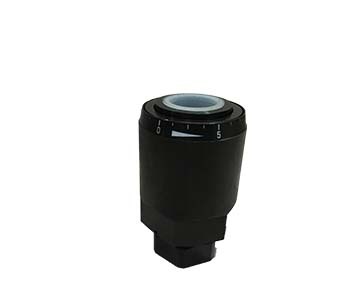 By rotating the sleeve, the cross-section of the throttling point can be steplessly adjusted. Siedman (Xiamen) Hydraulic Technology Co;Ltd is an professional supplier of hydraulic products ,we have our own brand Mannesmann Rexroth,and also provide products of BOSCH-REXROTH. We provide good quality, best service and reasonable price .Our products include Pump,motors,cylinder,valves, manifolds and plates, electronics, Systems,power units,accumulators,filters,oil treatment,oil measurement technology,tools and configurators. After many years of development , we have established several agents home and abroad ,offering comprehensive and advanced hydraulic solution for mechanical and engineering application, industrial automation ,renewable energy market etc,we focus on providing products and service that consistently exceed our customers` expectations and meeting regulatory requirements. We deliver top quality product in time and achieve customer satisfaction through continual quality and process improvement . Please feel free to contact us for all your requirement . Looking for ideal Hydraulic Throttle Valve Manufacturer & supplier ? We have a wide selection at great prices to help you get creative. All the Flow Control Valve are quality guaranteed. We are China Origin Factory of 2 Way Flow Control Valve. If you have any question, please feel free to contact us.